"GDP" redirects here. For other uses, see GDP (disambiguation). Gross domestic product (GDP) is a monetary measure of the market value of all the final goods and services produced in a period of time, often annually. GDP (nominal) per capita does not, however, reflect differences in the cost of living and the inflation rates of the countries; therefore using a basis of GDP per capita at purchasing power parity (PPP) is arguably more useful when comparing differences in living standards between nations. The OECD defines GDP as "an aggregate measure of production equal to the sum of the gross values added of all resident and institutional units engaged in production (plus any taxes, and minus any subsidies, on products not included in the value of their outputs)." An IMF publication states that "GDP measures the monetary value of final goods and services—that are bought by the final user—produced in a country in a given period of time (say a quarter or a year)." Total GDP can also be broken down into the contribution of each industry or sector of the economy. The ratio of GDP to the total population of the region is the per capita GDP and the same is called Mean Standard of Living. GDP is considered the "world's most powerful statistical indicator of national development and progress". William Petty came up with a basic concept of GDP to attack landlords against unfair taxation during warfare between the Dutch and the English between 1654 and 1676  Charles Davenant developed the method further in 1695. The modern concept of GDP was first developed by Simon Kuznets for a US Congress report in 1934. In this report, Kuznets warned against its use as a measure of welfare (see below under limitations and criticisms). After the Bretton Woods conference in 1944, GDP became the main tool for measuring a country's economy. At that time gross national product (GNP) was the preferred estimate, which differed from GDP in that it measured production by a country's citizens at home and abroad rather than its 'resident institutional units' (see OECD definition above). The switch from GNP to GDP in the US was in 1991, trailing behind most other nations. The role that measurements of GDP played in World War II was crucial to the subsequent political acceptance of GDP values as indicators of national development and progress. A crucial role was played here by the US Department of Commerce under Milton Gilbert where ideas from Kuznets were embedded into governmental institutions. The history of the concept of GDP should be distinguished from the history of changes in ways of estimating it. The value added by firms is relatively easy to calculate from their accounts, but the value added by the public sector, by financial industries, and by intangible asset creation is more complex. These activities are increasingly important in developed economies, and the international conventions governing their estimation and their inclusion or exclusion in GDP regularly change in an attempt to keep up with industrial advances. In the words of one academic economist "The actual number for GDP is therefore the product of a vast patchwork of statistics and a complicated set of processes carried out on the raw data to fit them to the conceptual framework." GDP can be determined in three ways, all of which should, in principle, give the same result. They are the production (or output or value added) approach, the income approach, or the speculated expenditure approach. The most direct of the three is the production approach, which sums the outputs of every class of enterprise to arrive at the total. The expenditure approach works on the principle that all of the product must be bought by somebody, therefore the value of the total product must be equal to people's total expenditures in buying things. The income approach works on the principle that the incomes of the productive factors ("producers," colloquially) must be equal to the value of their product, and determines GDP by finding the sum of all producers' incomes. This approach mirrors the OECD definition given above. Determine the [intermediate consumption], i.e., the cost of material, supplies and services used to produce final goods or services. Deduct intermediate consumption from gross value to obtain the gross value added. Gross value added = gross value of output – value of intermediate consumption. Value of output = value of the total sales of goods and services plus value of changes in the inventory. The sum of the gross value added in the various economic activities is known as "GDP at factor cost". GDP at factor cost plus indirect taxes less subsidies on products = "GDP at producer price". The value of output of all sectors is then added to get the gross value of output at factor cost. Subtracting each sector's intermediate consumption from gross output value gives the GVA (=GDP) at factor cost. Adding indirect tax minus subsidies to GVA (GDP) at factor cost gives the "GVA (GDP) at producer prices". The second way of estimating GDP is to use "the sum of primary incomes distributed by resident producer units". If GDP is calculated this way it is sometimes called gross domestic income (GDI), or GDP (I). GDI should provide the same amount as the expenditure method described later. By definition, GDI is equal to GDP. In practice, however, measurement errors will make the two figures slightly off when reported by national statistical agencies. This method measures GDP by adding incomes that firms pay households for factors of production they hire - wages for labour, interest for capital, rent for land and profits for entrepreneurship. These five income components sum to net domestic income at factor cost. Indirect taxes minus subsidies are added to get from factor cost to market prices. Depreciation (or capital consumption allowance) is added to get from net domestic product to gross domestic product. Compensation of employees (COE) measures the total remuneration to employees for work done. It includes wages and salaries, as well as employer contributions to social security and other such programs. Gross operating surplus (GOS) is the surplus due to owners of incorporated businesses. Often called profits, although only a subset of total costs are subtracted from gross output to calculate GOS. Gross mixed income (GMI) is the same measure as GOS, but for unincorporated businesses. This often includes most small businesses. The sum of COE, GOS and GMI is called total factor income; it is the income of all of the factors of production in society. It measures the value of GDP at factor (basic) prices. The difference between basic prices and final prices (those used in the expenditure calculation) is the total taxes and subsidies that the government has levied or paid on that production. So adding taxes less subsidies on production and imports converts GDP(I) at factor cost to GDP(I) at final prices. The third way to estimate GDP is to calculate the sum of the final uses of goods and services (all uses except intermediate consumption) measured in purchasers' prices. Market goods which are produced are purchased by someone. In the case where a good is produced and unsold, the standard accounting convention is that the producer has bought the good from themselves. Therefore, measuring the total expenditure used to buy things is a way of measuring production. This is known as the expenditure method of calculating GDP. U.S. GDP computed on the expenditure basis. C (consumption) is normally the largest GDP component in the economy, consisting of private expenditures in the economy (household final consumption expenditure). These personal expenditures fall under one of the following categories: durable goods, nondurable goods, and services. Examples include food, rent, jewelry, gasoline, and medical expenses, but not the purchase of new housing. I (investment) includes, for instance, business investment in equipment, but does not include exchanges of existing assets. Examples include construction of a new mine, purchase of software, or purchase of machinery and equipment for a factory. Spending by households (not government) on new houses is also included in investment. In contrast to its colloquial meaning, "investment" in GDP does not mean purchases of financial products. Buying financial products is classed as 'saving', as opposed to investment. This avoids double-counting: if one buys shares in a company, and the company uses the money received to buy plant, equipment, etc., the amount will be counted toward GDP when the company spends the money on those things; to also count it when one gives it to the company would be to count two times an amount that only corresponds to one group of products. Buying bonds or stocks is a swapping of deeds, a transfer of claims on future production, not directly an expenditure on products. G (government spending) is the sum of government expenditures on final goods and services. It includes salaries of public servants, purchases of weapons for the military and any investment expenditure by a government. It does not include any transfer payments, such as social security or unemployment benefits. X (exports) represents gross exports. GDP captures the amount a country produces, including goods and services produced for other nations' consumption, therefore exports are added. M (imports) represents gross imports. Imports are subtracted since imported goods will be included in the terms G, I, or C, and must be deducted to avoid counting foreign supply as domestic. According to the U.S. Bureau of Economic Analysis, which is responsible for calculating the national accounts in the United States, "In general, the source data for the expenditures components are considered more reliable than those for the income components [see income method, below]." GDP can be contrasted with gross national product (GNP) or, as it is now known, gross national income (GNI). The difference is that GDP defines its scope according to location, while GNI defines its scope according to ownership. In a global context, world GDP and world GNI are, therefore, equivalent terms. GDP is product produced within a country's borders; GNI is product produced by enterprises owned by a country's citizens. The two would be the same if all of the productive enterprises in a country were owned by its own citizens, and those citizens did not own productive enterprises in any other countries. In practice, however, foreign ownership makes GDP and GNI non-identical. Production within a country's borders, but by an enterprise owned by somebody outside the country, counts as part of its GDP but not its GNI; on the other hand, production by an enterprise located outside the country, but owned by one of its citizens, counts as part of its GNI but not its GDP. For example, the GNI of the USA is the value of output produced by American-owned firms, regardless of where the firms are located. Similarly, if a country becomes increasingly in debt, and spends large amounts of income servicing this debt this will be reflected in a decreased GNI but not a decreased GDP. Similarly, if a country sells off its resources to entities outside their country this will also be reflected over time in decreased GNI, but not decreased GDP. This would make the use of GDP more attractive for politicians in countries with increasing national debt and decreasing assets. Gross national income (GNI) equals GDP plus income receipts from the rest of the world minus income payments to the rest of the world. In 1991, the United States switched from using GNP to using GDP as its primary measure of production. The relationship between United States GDP and GNP is shown in table 1.7.5 of the National Income and Product Accounts. SNA93 provides a set of rules and procedures for the measurement of national accounts. The standards are designed to be flexible, to allow for differences in local statistical needs and conditions. Countries by 2015 GDP (nominal) per capita. Within each country GDP is normally measured by a national government statistical agency, as private sector organizations normally do not have access to the information required (especially information on expenditure and production by governments). The raw GDP figure as given by the equations above is called the nominal, historical, or current, GDP. When one compares GDP figures from one year to another, it is desirable to compensate for changes in the value of money – for the effects of inflation or deflation. To make it more meaningful for year-to-year comparisons, it may be multiplied by the ratio between the value of money in the year the GDP was measured and the value of money in a base year. For example, suppose a country's GDP in 1990 was $100 million and its GDP in 2000 was $300 million. Suppose also that inflation had halved the value of its currency over that period. To meaningfully compare its GDP in 2000 to its GDP in 1990, we could multiply the GDP in 2000 by one-half, to make it relative to 1990 as a base year. The result would be that the GDP in 2000 equals $300 million × one-half = $150 million, in 1990 monetary terms. We would see that the country's GDP had realistically increased 50 percent over that period, not 200 percent, as it might appear from the raw GDP data. The GDP adjusted for changes in money value in this way is called the real, or constant, GDP. The factor used to convert GDP from current to constant values in this way is called the GDP deflator. Unlike consumer price index, which measures inflation or deflation in the price of household consumer goods, the GDP deflator measures changes in the prices of all domestically produced goods and services in an economy including investment goods and government services, as well as household consumption goods. Constant-GDP figures allow us to calculate a GDP growth rate, which indicates how much a country's production has increased (or decreased, if the growth rate is negative) compared to the previous year. Another thing that it may be desirable to account for is population growth. If a country's GDP doubled over a certain period, but its population tripled, the increase in GDP may not mean that the standard of living increased for the country's residents; the average person in the country is producing less than they were before. Per-capita GDP is a measure to account for population growth. The level of GDP in countries may be compared by converting their value in national currency according to either the current currency exchange rate, or the purchasing power parity exchange rate. Current currency exchange rate is the exchange rate in the international foreign exchange market. Purchasing power parity exchange rate is the exchange rate based on the purchasing power parity (PPP) of a currency relative to a selected standard (usually the United States dollar). This is a comparative (and theoretical) exchange rate, the only way to directly realize this rate is to sell an entire CPI basket in one country, convert the cash at the currency market rate & then rebuy that same basket of goods in the other country (with the converted cash). Going from country to country, the distribution of prices within the basket will vary; typically, non-tradable purchases will consume a greater proportion of the basket's total cost in the higher GDP country, per the Balassa-Samuelson effect. The ranking of countries may differ significantly based on which method is used. The current exchange rate method converts the value of goods and services using global currency exchange rates. The method can offer better indications of a country's international purchasing power. For instance, if 10% of GDP is being spent on buying hi-tech foreign arms, the number of weapons purchased is entirely governed by current exchange rates, since arms are a traded product bought on the international market. There is no meaningful 'local' price distinct from the international price for high technology goods. The PPP method of GDP conversion is more relevant to non-traded goods and services. In the above example if hi-tech weapons are to be produced internally their amount will be governed by GDP (PPP) rather than nominal GDP. There is a clear pattern of the purchasing power parity method decreasing the disparity in GDP between high and low income (GDP) countries, as compared to the current exchange rate method. This finding is called the Penn effect. For more information, see Measures of national income and output. GDP per capita is often used as an indicator of living standards. The major advantage of GDP per capita as an indicator of standard of living is that it is measured frequently, widely, and consistently. It is measured frequently in that most countries provide information on GDP on a quarterly basis, allowing trends to be seen quickly. It is measured widely in that some measure of GDP is available for almost every country in the world, allowing inter-country comparisons. It is measured consistently in that the technical definition of GDP is relatively consistent among countries. Externalities – Economic growth may entail an increase in negative externalities that are not directly measured in GDP. Increased industrial output might grow GDP, but any pollution is not counted. Non-market transactions– GDP excludes activities that are not provided through the market, such as household production, bartering of goods and services, and volunteer or unpaid services. Non-monetary economy– GDP omits economies where no money comes into play at all, resulting in inaccurate or abnormally low GDP figures. For example, in countries with major business transactions occurring informally, portions of local economy are not easily registered. Bartering may be more prominent than the use of money, even extending to services. Quality improvements and inclusion of new products– by not fully adjusting for quality improvements and new products, GDP understates true economic growth. For instance, although computers today are less expensive and more powerful than computers from the past, GDP treats them as the same products by only accounting for the monetary value. The introduction of new products is also difficult to measure accurately and is not reflected in GDP despite the fact that it may increase the standard of living. For example, even the richest person in 1900 could not purchase standard products, such as antibiotics and cell phones, that an average consumer can buy today, since such modern conveniences did not exist then. Sustainability of growth– GDP is a measurement of economic historic activity and is not necessarily a projection. Wealth distribution – GDP does not account for variances in incomes of various demographic groups. See income inequality metrics for discussion of a variety of inequality-based economic measures. It can be argued that GDP per capita as an indicator standard of living is correlated with these factors, capturing them indirectly. As a result, GDP per capita as a standard of living is a continued usage because most people have a fairly accurate idea of what it is and know it is tough to come up with quantitative measures for such constructs as happiness, quality of life, and well-being. All these qualifications upon estimates of national income as an index of productivity are just as important when income measurements are interpreted from the point of view of economic welfare. But in the latter case additional difficulties will be suggested to anyone who wants to penetrate below the surface of total figures and market values. Economic welfare cannot be adequately measured unless the personal distribution of income is known. And no income measurement undertakes to estimate the reverse side of income, that is, the intensity and unpleasantness of effort going into the earning of income. The welfare of a nation can, therefore, scarcely be inferred from a measurement of national income as defined above. Distinctions must be kept in mind between quantity and quality of growth, between costs and returns, and between the short and long run. Goals for more growth should specify more growth of what and for what. Ever since the development of GDP, multiple observers have pointed out limitations of using GDP as the overarching measure of economic and social progress. Many environmentalists argue that GDP is a poor measure of social progress because it does not take into account harm to the environment. Although a high or rising level of GDP is often associated with increased economic and social progress within a country, a number of scholars have pointed out that this does not necessarily play out in many instances. For example, Jean Drèze and Amartya Sen have pointed out that an increase in GDP or in GDP growth does not necessarily lead to a higher standard of living, particularly in areas such as healthcare and education. Another important area that does not necessarily improve along with GDP is political liberty, which is most notable in China, where GDP growth is strong yet political liberties are heavily restricted. GDP does not account for the distribution of income among the residents of a country, because GDP is merely an aggregate measure. An economy may be highly developed or growing rapidly, but also contain a wide gap between the rich and the poor in a society. These inequalities often occur on the lines of race, ethnicity, gender, religion, or other minority status within countries. This can lead to misleading characterizations of economic well-being if the income distribution is heavily skewed toward the high end, as the poorer residents will not directly benefit from the overall level of wealth and income generated in their country. Even GDP per capita measures may have the same downside if inequality is high. For example, South Africa during apartheid ranked high in terms of GDP per capita, but the benefits of this immense wealth and income were not shared equally among the country. GDP does not take into account the value of household and other unpaid work. Some, including Martha Nussbaum, argue that this value should be included in measuring GDP, as household labor is largely a substitute for goods and services that would otherwise be purchased for value. Even under conservative estimates, the value of unpaid labor in Australia has been calculated to be over 50% of the country's GDP. A later study analyzed this value in other countries, with results ranging from a low of about 15% in Canada (using conservative estimates) to high of nearly 70% in the United Kingdom (using more liberal estimates). For the United States, the value was estimated to be between about 20% on the low end to nearly 50% on the high end, depending on the methodology being used. Because many public policies are shaped by GDP calculations and by the related field of national accounts, the non-inclusion of unpaid work in calculating GDP can create distortions in public policy, and some economists have advocated for changes in the way public policies are formed and implemented. The UK's Natural Capital Committee highlighted the shortcomings of GDP in its advice to the UK Government in 2013, pointing out that GDP "focuses on flows, not stocks. As a result, an economy can run down its assets yet, at the same time, record high levels of GDP growth, until a point is reached where the depleted assets act as a check on future growth". They then went on to say that "it is apparent that the recorded GDP growth rate overstates the sustainable growth rate. Broader measures of wellbeing and wealth are needed for this and there is a danger that short-term decisions based solely on what is currently measured by national accounts may prove to be costly in the long-term". It has been suggested that countries that have authoritarian governments, such as the People's Republic of China, and Russia, inflate their GDP figures. In response to these and other limitations of using GDP, alternative approaches have emerged. In the 1980s, Amartya Sen and Martha Nussbaum developed the capability approach, which focuses on the functional capabilities enjoyed by people within a country, rather than the aggregate wealth held within a country. These capabilities consist of the functions that a person is able to achieve. In 1990 Mahbub ul Haq, a Pakistani Economist at the United Nations, introduced the Human Development Index (HDI). The HDI is a composite index of life expectancy at birth, adult literacy rate and standard of living measured as a logarithmic function of GDP, adjusted to purchasing power parity. In 2005, Med Jones, an American Economist, at the International Institute of Management, introduced the first secular Gross National Happiness Index a.k.a. Gross National Well-being framework and Index to complement GDP economics with additional seven dimensions, including environment, education, and government, work, social and health (mental and physical) indicators. The proposal was inspired by the King of Bhutan's GNH philosophy. In 2009 Professors Joseph Stiglitz, Amartya Sen, and Jean-Paul Fitoussi at the Commission on the Measurement of Economic Performance and Social Progress (CMEPSP), formed by French President, Nicolas Sarkozy published a proposal to overcome the limitation of GDP economics to expand the focus to well-being economics with wellbeing framework consisting of health, environment, work, physical safety, economic safety, political freedom. In 2012, the Karma Ura of the Center for Bhutan Studies published Bhutan Local GNH Index contributors to happiness—physical, mental and spiritual health; time-balance; social and community vitality; cultural vitality; education; living standards; good governance; and ecological vitality. The Bhutan GNH Index. In 2013 professors John Helliwell, Richard Layard and Jeffrey Sachs published World Happiness Report and proposed to measure other wellbeing indicators in addition to GDP. the evaluation framework included GDP per capita, Gini (income inequality), life satisfaction, health, freedom of life choices, trust and absence of corruption. ^ a b "GDP (Official Exchange Rate)" (PDF). World Bank. Retrieved August 24, 2015. ^ "Finance & Development". Finance & Development | F&D. Retrieved 2019-02-23. 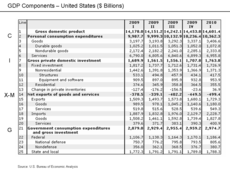 ^ "Gross Domestic Product | U.S. Bureau of Economic Analysis (BEA)". www.bea.gov. Retrieved 2019-02-23. ^ Hall, Mary. "What Is Purchasing Power Parity (PPP)?". Investopedia. Retrieved 2019-02-23. ^ a b c "OECD". Retrieved 14 August 2014. ^ Callen, Tim. "Gross Domestic Product: An Economy's All". IMF. Retrieved 3 June 2016. ^ Dawson, Graham (2006). Economics and Economic Change. FT / Prentice Hall. p. 205. ISBN 0-273-69351-4. ^ Lepenies, Philipp (2016). The Power of a Single Number: A Political History of GDP. New York: Columbia University Press. ISBN 978-0-231-17510-4. ^ "Petty impressive". The Economist. Retrieved August 1, 2015. ^ Coyle, Diane. "Warfare and the Invention of GDP". The Globalist. Retrieved August 1, 2015. ^ Dickinson, Elizabeth. "GDP: a brief history". ForeignPolicy.com. Retrieved 25 April 2012. ^ Lepenies, Philipp (April 2016). The Power of a Single Number: A Political History of GDP. Columbia University Press. ISBN 9780231541435. ^ Coyle, Diane (2014). GDP: A Brief but Affectionate History. Princeton University Press. p. 6. ISBN 9780691156798. ^ World Bank, Statistical Manual >> National Accounts >> GDP–final output Archived 2010-04-16 at the Wayback Machine, retrieved October 2009. "User's guide: Background information on GDP and GDP deflator". HM Treasury. Archived from the original on 2009-03-02. 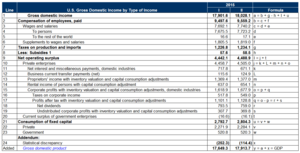 "Measuring the Economy: A Primer on GDP and the National Income and Product Accounts" (PDF). Bureau of Economic Analysis. ^ United States Bureau of Economic Analysis, "A guide to the National Income and Product Accounts of the United States" (PDF). , page 5; retrieved November 2009. Another term, "business current transfer payments", may be added. Also, the document indicates that the capital consumption adjustment (CCAdj) and the inventory valuation adjustment (IVA) are applied to the proprietor's income and corporate profits terms; and CCAdj is applied to rental income. ^ Concepts and Methods of the United States National Income and Product Accounts, chap. 2. ^ Lequiller, François; Derek Blades (2006). Understanding National Accounts. OECD. p. 18. ISBN 978-92-64-02566-0. To convert GDP into GNI, it is necessary to add the income received by resident units from abroad and deduct the income created by production in the country but transferred to units residing abroad. ^ United States, Bureau of Economic Analysis, Glossary, "GDP" Archived 2018-01-29 at the Wayback Machine. Retrieved November 2009. ^ "U.S. Department of Commerce. Bureau of Economic Analysis". Bea.gov. 2009-10-21. Archived from the original on 2011-07-21. Retrieved 2010-07-31. ^ "National Accounts". Central Bureau of Statistics. Archived from the original on 2011-04-16. Retrieved 2011-06-29. ^ Based on the IMF data. If no data was available for a country from IMF, I used WorldBank data. Some of the complications involved in comparing national accounts from different years are explained in this World Bank document Archived 2010-06-16 at the Wayback Machine. ^ a b c "How Do We Measure Standard of Living?" (PDF). The Federal Reserve Bank of Boston. ^ Mankiw, N. G.; Taylor, M. P. (2011). Economics (2nd, revised ed.). Andover: Cengage Learning. ISBN 978-1-84480-870-0. ^ a b c "Macroeconomics - GDP and Welfare". Retrieved 2015-02-21. ^ Choi, Kwan. "Gross Domestic Product". Introduction to the World Economy. ^ "How Real GDP per Capita Affects the Standard of Living". Study.com. ^ van den Bergh, Jeroen (April 13, 2010). "The Virtues of Ignoring GDP". The Broker. ^ Gertner, Jon (May 13, 2010). "The Rise and Fall of G.D.P." New York Times Magazine. ^ Drèze, Jean; Sen, Amartya (2013). An Uncertain Glory: India and its Contradictions. Princeton: Princeton University Press. ISBN 9781400848775. ^ "China Country Report Freedom in the World 2012". freedomhouse.org. ^ Nussbaum, Martha C. (2013). Creating capabilities : the human development approach. Cambridge, Massachusetts: Belknap Press of Harvard University Press. ISBN 0674072359. ^ "Incorporating Estimates of Household Production of Non-Market Services into International Comparisons of Material Well-Being". ^ Holcombe, Randall G. (2004). "National Income Accounting and Public Policy". Review of Austrian Economics. 17 (4): 387–405. doi:10.1023/B:RAEC.0000044638.48465.df. ^ Ingraham, Christopher (15 May 2018). "Satellite data strongly suggests that China, Russia and other authoritarian countries are fudging their GDP reports". SFGate. San Francisco. Washington Post. Retrieved 16 May 2018. ^ Shahani, Severine Deneulin; Lila (2009). An Introduction to the Human Development and Capability : Approach (1. ed.). London: Earthscan Ltd. ISBN 9781844078066. ^ "Gross National Happiness (GNH) - A New Socioeconomic Development Policy Framework - A Policy White Paper - The American Pursuit of Unhappiness - Med Jones, IIM". Iim-edu.org. 10 January 2005. ^ "Harvard Kennedy School Report to US Congressman 21st Century GDP: National Indicators for a New Era" (PDF). ^ "GDP and beyond: Measuring progress in a changing world". European Union. 2009. Retrieved 2012-02-26. Coyle, Diane (2014). GDP: A Brief but Affectionate History. Princeton, NJ: Princeton University Press. ISBN 978-0-691-15679-8. Australian Bureau for Statistics, Australian National Accounts: Concepts, Sources and Methods, 2000. Retrieved November 2009. In depth explanations of how GDP and other national accounts items are determined. United States Department of Commerce, Bureau of Economic Analysis, "Concepts and Methods of the United States National Income and Product Accounts" (PDF). Archived from the original (PDF) on 2017-11-08. Retrieved 2018-03-09. . Retrieved November 2009. In depth explanations of how GDP and other national accounts items are determined. Wikimedia Commons has media related to Gross domestic product. Gross National Happiness USA United States-based non-profit working to increase collective well-being by changing how we measure progress and success. Historicalstatistics.org: Links to historical statistics on GDP for countries and regions, maintained by the Department of Economic History at Stockholm University. Historical US GDP (yearly data), 1790–present, maintained by Samuel H. Williamson and Lawrence H. Officer, both professors of economics at the University of Illinois at Chicago. The Maddison Project of the Groningen Growth and Development Centre at the University of Groningen, the Netherlands. This project continues and extends the work of Angus Maddison in collating all the available, credible data estimating GDP for different countries around the world. This includes data for some countries for over 2,000 years back to 1 CE and for essentially all countries since 1950. Gross Domestic Product: An Economy’s All, International Monetary Fund. Rodney Edvinsson, "Growth, Accumulation, Crisis: With New Macroeconomic Data for Sweden 1800–2000". Jerorn C.J.M. van den Bergh, "Abolishing GDP"
This page was last edited on 6 April 2019, at 09:10 (UTC).